Here’s something that’s sure to surprise you: Heat pumps aren’t just for heating. These energy efficient appliances, so good at keeping our homes warm and dry during winter, are equally adept at bringing the temperature down when summer rolls around. Instead of fans, here’s why we think a heat pump/air conditioner is a better investment. Consider the following household, which we’ll call House A. They’ve got heaters upstairs and downstairs, as well as fans in every room. Each month, depending on the season, heating and cooling take up a fair portion of their electricity bill. Now consider House B. Instead of the mix of heating and cooling appliances, they’ve got heat pumps, properly spaced to heat and cool the main living areas and bedrooms. What’s more, they’ve opted for the smartphone controlled units, meaning they can start cooling their house on their way home from work, or even turn the units off remotely. In 2014, research company Canstar Blue surveyed 856 New Zealanders and found that after installing heat pumps, kiwis came away impressed. Interestingly, 88 per cent found their homes drier and easier to heat, while 50 per cent noticed cheaper power bills. Lastly, 53 per cent noticed improved health. If you’re interested in a heat pump, we think it’s best to go with a leading brand – one with a reputation for quality and reliability. This summer, consider a Daikin heat pump. Daikin has a range of units to suit households small and large. The Split System Heat Pumps are best suited for air conditioning one room or a specific area of the house. 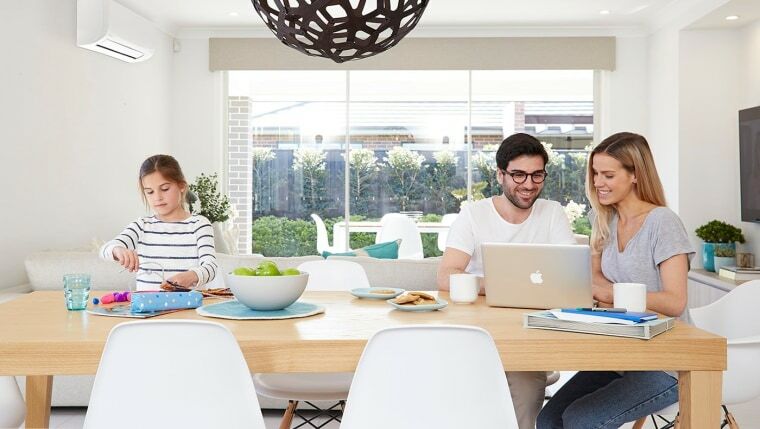 For larger homes, the Multi Split Heat Pumps can heat or cool multiple rooms using only one outdoor unit connected, which then connects to multiple indoor units. Some models also come with smartphone control, making it easy to control the temperature from your phone or tablet – wherever you are. Furthermore, during summer and the air is filled with pollen – one of the main triggers of asthma and allergies. In fact, New Zealand has some of the highest rates of asthma in the world. Your home should be an escape from the allergy triggers brought on by both warm and cold weather – and it can be. By choosing the right heat pump and air purifier system, you can help improve the air quality at home throughout the year. Daikin is proud that many of its heat pump models are approved by the Asthma and Respiratory Foundation NZ Sensitive Choice® programme, which means that with Daikin, you can be sure you're making the right choice. Daikin systems are only available through the Daikin Specialist Dealer network. They come to you to recommend the right tailored solution that’s dependent on your home’s design, the number of occupants, any health requirements and specific heating and cooling needs – so get in touch to request your quote.